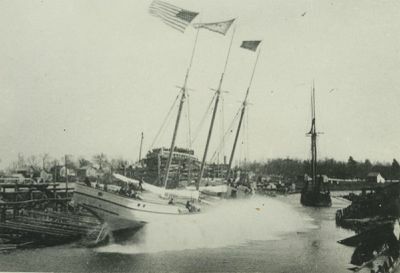 1888, May 16 Enrolled Port Huron, MI; maiden voyage Au Sable, MI. 1896, Mar 23 Enrolled Duluth, MN; owned Alex R. Sinclair, Duluth, Henry Fish, St. Clair, MI., & George W. Pack, Asheville, NC. 1896, Sep 30 Ashore near Fort Erie, Buffalo harbor. 1897 Enrolled Duluth, MN; owned Alex R. Sinclair, Henry Fish, St. Clair, MI & A.W. Comstock, Alpena, MI. 1909, May 16 Badly listed & waterlogged Marquette after springing leak during gale in tow of steamer SIMON LANGELL. 1916, Apr 21 Owned Pringle Barge Line, Detroit. 1916, Apr 28 Owned Moore McCormack Lines, New York; sent to Atlantic coast with steamer GETTYSBURG & barge ALEX ANDERSON. 1923 Tobacco interests; Cuban owners.